Who Were the First Black Superheroes? In the world of superhero comic books, Black and African-American characters have been woefully under-represented over the years. That is starting to change, with both of the major comics companies (Marvel and DC) working hard to create diverse characters and make their comic-book universes more inclusive. One of the unintended consequences of most comic book creators (writers and artists) being White, is that most of the characters they created, especially in the period from the 1940s though the 1970s, are also White. Black or African-American comic book superheroes were non-existent in the two major comic book companies until the mid-1960s. Then, in 1966, two white, Jewish, first-generation American creators, Stan Lee and Jack Kirby, revolutionized comic books by introducing the first Black superhero. The Black Panther appeared in 1966 in the pages of the popular Fantastic Four comic book series, and, as they say, the rest is history. The following chronological list of major Black Superheroes provides some background on the history of the first major Black superhero characters in comics. 1966: The Black Panther-T'Challa, Prince (and later King) of the fictional African nation of Wakanda, first appeared in Fantastic Four #52 in 1966. He made his first film appearance in 2016's Captain America: Civil War. 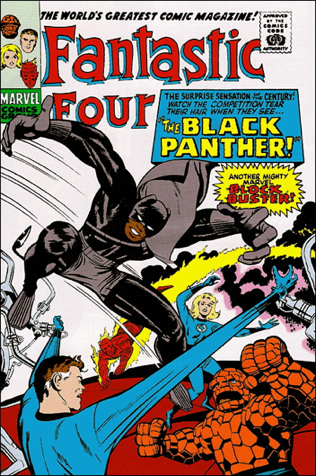 Black Panther is the first Black Superhero to appear in a major American comic book. Black Panther is a member of the Avengers. In Captain America (vol.7) #25 (2015), Sam Wilson takes on the mantle of Captain America (so appointed by the original Cap, Steve Rogers, who could no longer serve as Captain America). 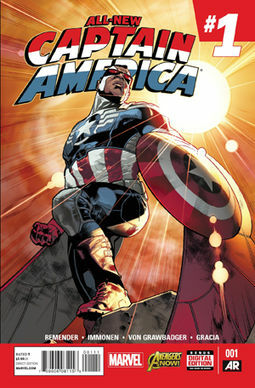 Multiple white characters have served as Cap in the past, and Sam Wilson is the first Black Captain America. Sam Wilson as the Falcon/Captain America is a member of the Avengers. 1972: Luke Cage/Power Man: Luke Cage first appeared in 1972's Hero for Hire #1. He was a former convict who gained super-strength and unbreakable skin in experiments conducted on convicts in prison. After leaving prison, Cage becomes a hero, working primarily in urban areas helping regular people. The basic motivation for creation of this character were the popular "Blaxploitation" films of the 1970s. While the original Luke Cage sported an afro and rather wild 1970s outfits, his modern (in both comics and TV) appearance is with a shaved head, jeans, and a muscle-shirt. Generally considered one of the most bad-assed characters in the Marvel Universe. This comic was re-titled Luke Cage: Power Man with issue #17. Luke Cage's first on-screen appearance came in the Marvel Netflix series Jessica Jones, played by actor Mike Colter. Luke Cage has been a member of Heroes for Hire and the Avengers. Luke Cage was the first Black comics character at either Marvel or DC to get his own comic book series. 1973: Blade (Eric Brooks): A human who was infected in utero by a vampire biting his mother, Blade has many vampiric abilities, but not their weakness to sunlight. Blade is a vampire-hunter known as The Day-Walker. He first appeared in Tomb of Dracula #10. He was portrayed by actor Wesley Snipes in the Marvel movies. In the comics, Blade, born in London, is English (though Black), while his on-screen depictions have him as an African-American from Detroit. 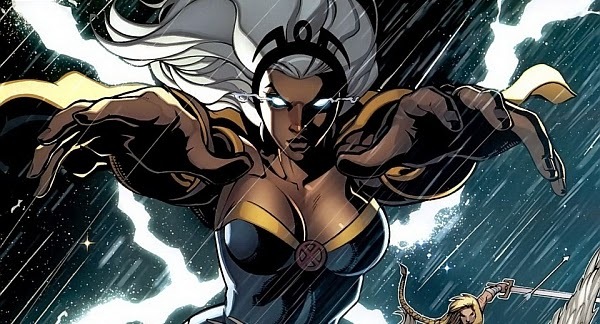 1975: Storm (Ororo Munroe): The first Black female superhero, Storm is also the first Black member of the X-Men. Storm first appeared in Giant-Size X-Men #1(1975). 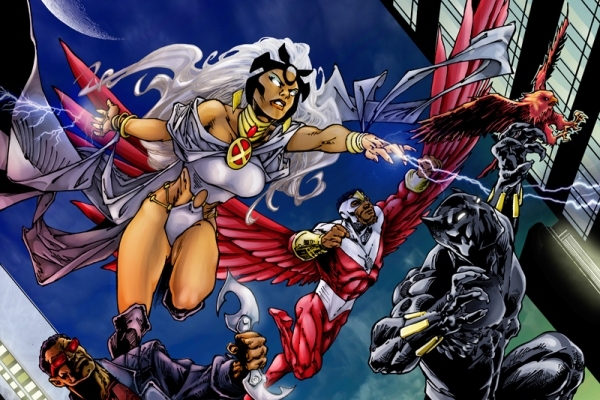 Ororo Munroe is the daughter of a Kenyan princess who married an American photographer. After Ororo's birth in New York, the family travels to Cairo, Egypt, where her parents are killed and she becomes an orphan, living as a petty thief on the streets of Cairo. She is discovered by Professor Xavier, who recruits her into the X-Men. Her mutant abilities give her control of the weather. She is often referred to as a "weather witch," though her powers are based on her being a mutant, and not through magic. She is a major character in the X-Men, and has served as team leader on multiple occasions. She married Black Panther in the comics, though the marriage did not last. Storm has been played by Halle Berry in the X-Men movies. 1971: Green Lantern (John Stewart): The first Black superhero in DC Comics, John Stewart debuted in Green Lantern #87 in December, 1971. 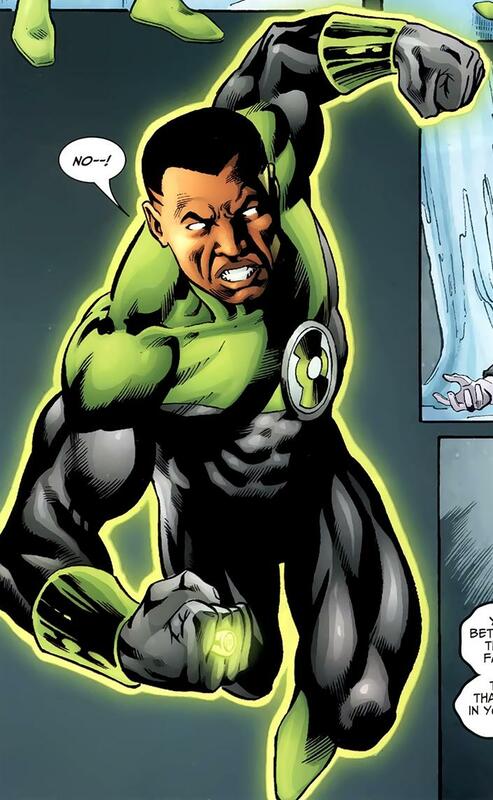 He serves as a member of the Green Lantern Corps, and originally was chosen in the comic book as a replacement for the regular Green Lantern was injured, and the semi-sentient Green Lantern ring had to select a new hero. 1977: Black Lightning (Jefferson Pierce): The second Black superhero in DC Comics, Black Lightning first appeared in Black Lightning #1 (1977). Black Lightning now has his own show on TV, via the CW channel, starring Cress Williams as the hero. Black Lightning has also appeared in several of DC's animated TV shows, voiced by actors Bumper Robinson and Blair Underwood. 1980: Cyborg (Victor Stone): Cyborg is probably the best known and most popular of DC's African-American heroes. His first appearance was in DC Comics Presents #26 (1980) Ironically, for a comic book hero, he is best known as a character on various animated TV shows, especially the Teen Titans programs, and he has been introduced into the DC movie universe in both TV and movies. He was portrayed in TV's Smallville show by Lee Thompson Young, and in various animated shows by Ernie Hudson, Khary Payton, among others. He finally appeared in the movies in a cameo in Batman v Superman: Dawn of Justice played by Ray Fisher. A solo Cyborg movie is planned for 2020. It is safe to say that Marvel Comics has been a lot more inclusive of Black characters than DC over the years. 1963: Gabriel "Gabe" Jones: Gabe Jones was an African-American soldier in World War Two, serving with Sgt. Nick Fury (a white guy in the comics, played by Samuel L. Jackson in the Marvel movies) as a member of Fury's special forces unit, the Howling Commandos. Gabe Jones first appeared in Sgt. Fury and his Howling Commandos #1 (May 1963). 1966: Bill Foster: A character who first appeared as a non-powered supporting character is Marvel Comics character Bill Foster, who, as a non-super-powered character, first appeared in Avengers #32 in 1966. Foster later, in Power Man # 24 (1975), gained size-changing powers and became Black Goliath. The non-powered Bill Foster appeared in the 2018 Marvel movie Ant-Man and Wasp, and, though not using any powers in this film, the story indicated that in the past, Foster used growth technology to become a "goliath." 1967: Robbie Robertson: One of Marvel's most significant African-American supporting characters is newspaperman Robbie Robertson, who serves as the second in command at the Daily Bugle newspaper, and is a significant member of Spider-Man's supporting cast. He first appeared in The Amazing Spider-Man #51 (August 1967). It should also be mentioned that the first African-American comic book character with his own title was published by Dell Comics (never considered one of the major comics companies), was Lobo, an African-American hero in a Western-themed comic. The Lobo series ran to only two issues (in 1965 and 1966), and was discontinued due to poor sales. One of the creators of this character, Tony Tallarico, claimed that most copies of the comic were returned by retailers because they did not want to sell a comic book featuring a Black hero. NOTE: DC later introduced a character named Lobo. No relation to Dell's Lobo, as the DC character is a chalk-colored alien from another planet.